In the last couple weeks, I downloaded Google SketchUp, watched the first few demo videos, and jumped in on the design. I think I have a pretty good idea of how my cab will look now. Still no idea if I'll go with basic black, or include some sort of graphic design/theme. My next steps are to design a wheeled base, and to figure out a 2x4 "skeleton" for the inside that will give it some structural support. Also, I need to figure out what I'll do for the control panel. I think I'll be borrowing heavily from SlagCoin.com for that part. 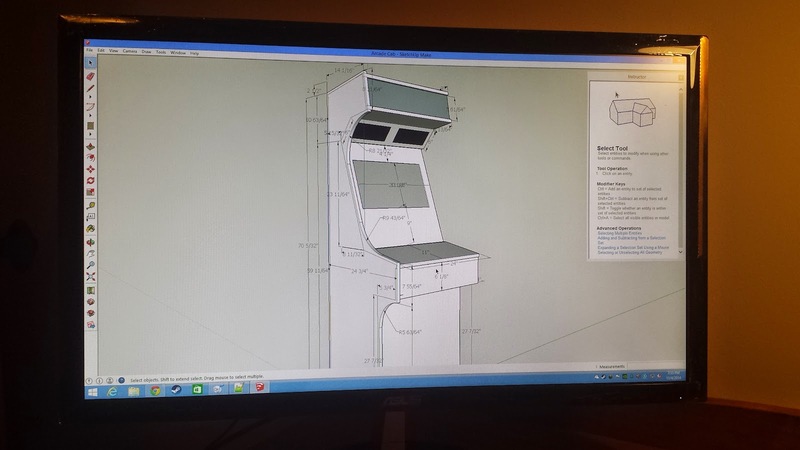 My plan is to make the control panel removable (an idea I got from markc74's Blip cab), so I can swap it with an equal-sized flat surface that is mounted on the top of the cab. That way, I can easily switch back and forth between playing arcade-style games and mouse/keyboard games. In the meantime, I finally have the PC assembled and running, and I'm loading the necessary software onto it. For the emulation frontend software, it came down to a decision between HyperSpin and GameEx. I decided on GameEx, in part because I'd already bought an older version of the software years ago (that I'd always intended on using, but never did). That, and the software seems to be more actively supported than HyperSpin. Also, I'm pretty sold on their upcoming GameEx Evolution release (which hopefully makes it past its current vaporware state). I wasn't expecting the frontend to cost as much as it does; especially since it looks like I'll also need to buy a subscription to EmuMovies to get everything running the way I want it. All told, it looks like the emulation software is going to cost an extra $83 that I wasn't expecting (and that's after I got a 20% discount on my GameEx Evolution pre-order for being a previous customer, which came with a 25% off coupon for EmuMovies).